Mix water, yeast, and sugar (first 3 ingredients) in small bowl and let it sit until bubbly. Mix about 10 cups of the flour and the other dry ingredients in a large bowl. Add 6 cups of warm water, yeast mixture, and butter or shortening to the dry ingredients. 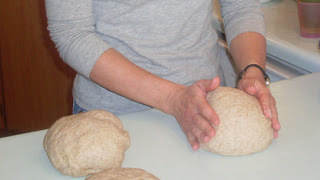 Add flour as needed to make the dough handleable. Knead for a few minutes (I usually break the dough in half to knead it more easily). Put dough in greased bowl and let rise until doubled. 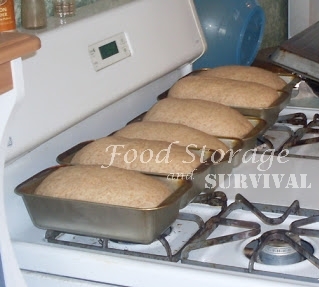 Punch down and form into loaves (this recipe makes 6 loaves) and place into greased loaf pans. Let rise about 15 minutes more. Bake at 350 for 40-45 minutes until golden brown. YUMMY! This is the recipe I made yesterday with a couple of friends there to learn. It went really well and I have my bread made for the next couple of days! Gluten flour: This is the flour that makes your bread hold together better. Store bread is very high in gluten–that’s what makes is so gummy, too much gluten. Gluten flour can be purchased in bulk from Honeyville or other bulk foods suppliers or purchased a little at a time at health food stores or in specialty flour sections of some grocery stores. Powdered Milk: I use the non instant powdered milk. You could use regular milk for part of your 6 cups of warm water if you want instead. Bean flour: I suppose I’ll have a whole post on bean flour at a later time. Bean flour is ground white beans (navy, small white, etc.). 1/4 of any recipe’s flour can be substituted with bean flour. Nice way to add beans to your diet and your kids will never know there’s beans in their cookies! Homemade bread is less expensive and WAY better tasting than store bread. It also is good because you know exactly what is in it. And make as many as you want–it freezes and thaws as good as fresh! I use the cheapo metal pans and have used them so long they are “seasoned” and the bread does not stick. I wipe out the pan when I’m done and it’s ready for the next batch. I used to wash them, but it ended up making rust if I didn’t get it dried fast and the bread would stick to the pans. I have a really big stainless steel bowl that my sweet husband got for me to make bread in. It holds all the ingredients for the full 6 loaves–Love it! 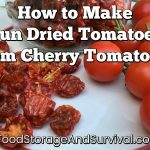 You can use this recipe with all white or all wheat flour or any combination of the two to reach the total flour quantity. If you use all wheat flour you can skip the first raising and just shape loaves and put it in the pans as soon as you’re done kneading. Shaping the bread into loaves. That made me tired reading it. I like homemade bread, but thank heavens for my Bosch mixer! Yes, I used to make it by hand, so I could do it if I didn’t have the Bosch in a dire circumstance (no power), but if that happens I’ll be calling you for help on what to do without an oven. Great job. I bet it was yummy. I probably need to join you sometime. The no oven situation would not be good . . . I’ve thought I could probably stuff 2 loaves in a dutch oven–they’d just be shaped like half circles when they were done, but it might work–I’ll have to try it some time . . . I love that you are showing how to do homemade bread! I’m a pastry chef and stay at home mom who has been trying to retrain folks on this art for quite some time. I bake mine in a solar oven and it is great for self reliance! Excellent blog! No oven isn’t really that much of a problem, Emily. Keep an eye out for one of those old collapsible Coleman ovens, or any small metal box, really. Set it on any good heat source and rock on. Also, taking bits of the dough and patting/rolling/stretching it out and cooking it in a cast iron skillet works just fine. It’s more (light) work and they make kind of odd looking sandwiches but bread is bread! My husband and I don't eat enough bread for me to make 6 loaves at a time and we don't have enough freezer space for the extras. I know that you don't reduce the yeast by the same percentage as the rest of the ingredients when you cut a bread recipe down, but I'm not sure how much you would reduce the amount of yeast. Have any suggestions on that? Say I was going to halve or quarter this recipe, for instance – how much yeast would I use? By the way, my hubby's going to a conceal carry class next Saturday. I would have gone with him, but I already had plans, plus the class was full. What is “non instant powdered milk”? I thought all powdered milk was instant (as in just add water). Instant and non-instant powdered milks have been processed slightly differently. They all do mix with water, but the non-instants are best mixed into warm water or mixed with a blender to get all the lumps out while the best instant milks like the Thrive Instant Milk can be mixed into cold water with a spoon and dissolve quickly. I am interested in making your recipe but I live alone &would like to half the recipe. Can I just divide everything in half or would that cause a problem with the rising? You can cut it in half (to make 3 loaves) or thirds (for two loaves) pretty easily. It will not cause any problems–pretty sure my mom just does a two loaf version of it and gets great results.